So, you’ve had a professional mold testing done in your house and your worst suspicion has been confirmed. The very thought of this issue can strike fear into the heart of even the toughest homeowners. However, you can no longer deny the fact and it’s time to take some action. So, say it with me: My home has a mold problem! Now that you have accepted the worst, the experts at RestoPros are here to help with some advice about what you can do from here. You should have a mask or respirator, eye protection, rubber gloves, a fan, and a dehumidifier. You do not want to risk inhaling the mold spores you will be cleaning. If the intense list of protective gear was not a clear indication, mold is not something you can clean with everyday cleaning supplies. On the contrary, you will need to procure non-ammonia detergent, chlorine bleach, and white vinegar to mix your cleaning solution. Make sure you have plenty of rags and more than one scrub brush (both of which should be disposed of after you finish treating the mold). You should also have a large pail and a plastic garbage bag. This is an important first step to keep mold spores from releasing into the air. With a damp rag soaked in plain water, coat the affected area. With your scrub brush and detergent, remove as much of the mold as you can, and dispose of the brush. In your large pail, mix together 1 ½ cups of chlorine bleach to 1 gallon of water. Use a new rag to generously coat the affected surface with this mixture. Once this is done, let it soak for 15 minutes. With a new scrubbing brush, scrub the area with the bleach solution thoroughly and rinse with clean water. Repeat this bleach step until all visible mold is gone. 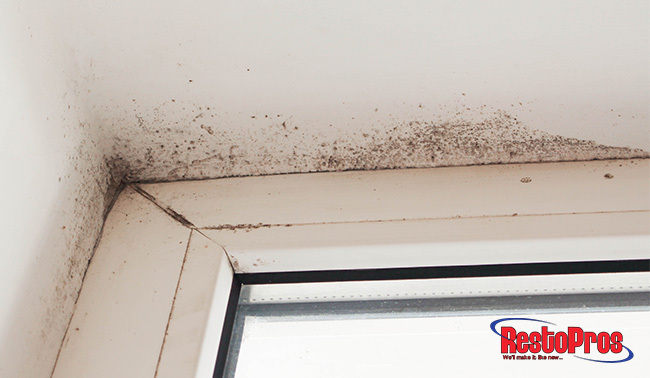 Use your fan and dehumidifier to dry the area thoroughly to prevent new mold growth. Unless you chose to wear work clothes that you don’t mind disposing of, wash the clothes you wore for the mold treatment immediately. Place them in a plastic bag to transport them to the washing machine. Add ¾ cup white vinegar to the water to kill the mold spores on your clothing. My Home Has a Mold Problem! What Else Can I Do? If you have followed the previous steps and removed the mold on your own, you have already saved money on professional mold removal. The best thing you can do for the long-term safety of your home is to enlist the help of mold remediation experts you can trust. Let the knowledgeable team at RestoPros take it from here. Call us at (855) 587-3786 or fill out a service request form online to conquer your mold problem today!